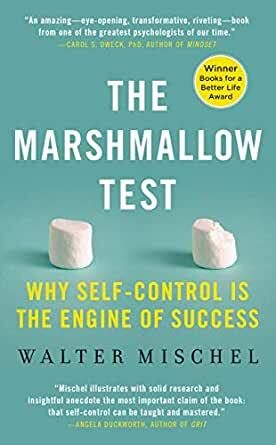 The Marshmallow Test: Mastering Self-Control - Kindle edition by Walter Mischel. Health, Fitness & Dieting Kindle eBooks @ Amazon.com. "Walter Mischel is one of the most influential psychologists of the 20th century, and The Marshmallow Test will make him one of the most influential in this century, too. "―Steven Pinker, Johnstone Professor of Psychology, Harvard University, and the author of The Better Angels of Our Nature. The Marshmallow Test provides interesting anecdotes related to self control and the disastrous effects of lacking it. The main theme is how childrens' self control, evaluated through taking the marshmallow test- forgoing eating one marshmallow for a later reward of two marshmallows- manifests throughout later life. The problem I have with this book is that the conclusions do not seem convincing, the author constantly qualifies his assessments by saying of course there are cases that do not follow the norm. It also does not get to the root of self-control, it instead assumes the outcome of one test as the baseline. It similarly does not explain the basis of the hot and cool systems, but just takes for granted their fundamentality. A positive aspect of the book is the conclusion that self control is not innate and can be effectively improved and cultivated throughout one's life. It also shows the enormous and varied ways self control affects one's life. Lastly, It is interesting because it covers a variety of psychological tests that anybody can relate to. Even if it is not groundbreaking, it is still worth the time to read. As a parent, I feel so much more qualified and ready to empower my three kids to take control of themselves as they grow. As a 40-something man who is in need of help gaining some sense of self control, I feel like I've picked up a few nuggets of wisdom here and there about how the subject matter can be applied to who I am now, but not enough to resolve my more immediate needs. There is a lot of great information about shaping those who are in the early stages of development, but not much to apply practically (beyond the last couple of chapters) to well-ingrained issues being addressed in those of us further along the journey. Walter Mischel, the author of this fascinating book, is a 84 year old professor at Columbia University. Mischel became known at the end of the 1960s, mainly through his publications about two topics. The first topic was the degree to which situations influence human behavior. He did research which showed that the idea that people have stable personality traits which cause us to behave consistently over many situations is largely a myth. Instead, he demonstrated, we tend to behave quite differently in different contexts. Thus, characteristics of situations have a significant influence on how we behave. There is a lot to love here. First, this is the book by the guy who invented the famed Marshmallow Test so being able to read about it from its creator is helpful and interesting. Secondly, he does a great job making the ideas of self-control practical and useful. I thought it lagged a little in the middle and isn't always an easy read but it's solid and very useful. Great stuff. If you persevere you will learn how to build your self-control or help your child grow their self-control. I'm struggling to read this book. I am familiar with the test and the outcomes. Since the book is 279 pages (not included notes, index et al) I thought there might be some gripping information. The book is just slow and wordy. Instead of getting to the point, it explains that there may be a surprise conclusion to the studies and tests performed based on expectations and scientific experience, but then there's no surprise conclusion and it was all just filler words. 5.0 out of 5 starsMust-read for those in difficulty. This is a very good book especially when you feel yourself in tough situation in your job career. I first bought this book for some reference for bringing up my child who is about to be 3 years old and getting more assertive in some situation losing her "self-control." I found this book, however, pretty useful even for adults, getting its message that they can also change their view and behavior when they meet some temptation using if-then strategies. This happened to coincide with my present situation where I feel myself in bleak condition for my present and future career, and feeling strong temptation to flee to more easy job. After reading, I'm more determined to face the present situation and have more grit. Really liked the book and was nice how they followed the test subjects from childhood through adulthood, while also providing meaningful advice on how to better my own, and my kids', self-control. Does get a wee bit repetitive over the course of the book with many of the test cases being very similar, but it continues to be educational and entertaining. It's also technical enough without being too clinical in nature. I really liked it and would recommend to anyone trying to teach self control to their children, or even learn a bit themselves.